Donate Today! A little goes a long way. Let's Pawty for our homeless pets! Our first-ever FIESTA & FAJITA Cook-Off promises to deliver an afternoon of family and fur-friendly fun for all! Admission is FREE, and kicks off Saturday, May 25th, from 1-7 pm, at Heritage Place Park in Conroe. Plenty of fun, entertainment, and food for the whole family (yes, your 4-legged amigos are welcome too), with proceeds to support Operation Pets Alive’s life-saving work with the homeless animals of Montgomery County. Don't miss out on shopping from local artisan vendors, live folkloric dance performances, mouth-watering fajita tastings, yummy churros, great Raffle prizes, top-notch Silent Auction items, and so much more! Drop by and meet our adoptable pets! Get creative and enter YOUR pet on our Fiesta-themed Pet Costume Contest and Parade! Participate in the Fajita Cook-Off! Sponsorship opportunities available (Pick from 1 of 4 levels)! Market Vendor Booth Space available! Get Involved as a Raffle Item or Silent Auction Basket donor! Operation Pets Alive! is an all volunteer-run, 501(c)(3) non-profit animal rescue, working towards a #NoKill Montgomery County! We extend our thanks to City of Conroe Parks and Recreation for hosting our 2019 FIESTA & Fajita Cook-off! Puppy and kitten season is upon us! Both the Conroe Shelter and Montgomery County Animal Shelter are seeing an uptake in litters of puppies and kittens. Plea after plea are put out for adopters, fosters and rescues to step up and help, yet despite combined efforts, we see little relief in sight. Operation Pets Alive is seeking to expand both our Dog/Puppy, Kitten/Cat Foster Teams, so we can continue to answer the call to save lives while working towards a No Kill Community. As a rescue who partners with both the Montgomery County Animal Shelter (MCAS) and the Conroe Animal Adoption Center (CAAC), the availability of foster homes directly impacts our ability to help these open-intake shelters. Puppies and kittens wait in overcrowded shelters for us. Pets with medical needs wait. We also have a number of pups in boarding that need foster homes. While boarding is not an optimal solution, it is a temporary solution, and frees up kennel space for those remaining in the shelter who are most at risk for euthanasia. All our pups in boarding have been assessed for good temperament and suitability for our Transport and/or Local Adoption Programs. If you have ever thought about fostering, make NOW the time to take that jump. When you foster for OPA, you will not be alone. You join a family of dedicated fosters, willing to walk you through every step. We have short-term and longer-term fostering opportunities. Fostering is so important ~ it helps us learn more about each pet, and how they do in a home environment. It readies them for adoption to loving families. In 2017 alone, OPA rescued over 3,125 pets from our local shelters, and from within our community, plus impacted the lives of countless other through our Core Programs. But we need help, from you in our community, to keep saving lives! If you’re ready to be part of the solution for a No Kill Montgomery County, drop us an email letting us know what type of foster(s) will best fit your family situation. Can’t foster, but want to help? New Volunter Orientations are held monthly, beginning at 6:30 pm at the South County Community Center in the Woodlands (2235 Lake Robbins Dr.). Our Volunteer Coordinator will go over the countless ways in which you can help support our homeless pets, and life-saving Core Programs. Over 3,500 lives have been saved through OPA’s ground transport program since 2011. Wednesday, August 29th, 2018, OPA celebrates a special milestone ~ Our 400th Pups On Trucks transport, and we’d love to have you join us! Our ground transport program gives deserving shelter and community dogs second chances at loving homes, through partnering Rescues and Shelters, in areas of the country where there exists a higher demand for adoptable pets. The 400th Pups On Trucks transport will begin loading at 10:30 am, and and depart at 11 am, from the parking lot of Blue Pearl Veterinary Clinic located at: 1646 Spring Cypress Rd, Spring TX. Come see our ground transport in action, bid our pups farewell, and enjoy cake and refreshments! Since OPA’s inception in 2011, we have transported over 3,500 pups ~ most of them shelter dogs, overlooked, or whose lives were at risk in local shelters. To date, this year, we have transported almost 500 pups to our partnering shelters and rescues, where forever families anxiously await to adopt. Our Pups On Trucks Transport program relies on so many to help make it happen. Our thanks go out to our dedicated fosters, our hard-working Transport Team volunteers, our veterinary and shelter partners, and our transport partners at P.E.T.S. LLC. In addition, we so appreciate all the adopters, on the receiving end, who give these pups the wonderful homes and families they so deserve! And lastly, we thank you, our supporters ~ your donations fuel these life-saving transports! To make a donation towards our Transport Program, just click the Donate button on this page. Petco Foundation Invests In Lifesaving Work of Operation Pets Alive! Grant of $90,000 over two years will extend efforts to save more animal lives in Montgomery County. The Woodlands, 8/6/2018 – Operation Pets Alive is both thrilled and grateful to announce it has been awarded a $90,000 grant over the next two years, from the Petco Foundation, to support our life-saving programs. This grant will extend our efforts to minimize local shelter intakes through our spay/neuter program, and maximize live release rates through our adoption and transport programs. Since our inception in 2011, Operation Pets Alive has helped over 15,300 homeless dogs and cats from Montgomery County find a safe place to land. From humble beginnings of only 107 dogs and cats adopted our first year, OPA adopted 1,401 dogs and cats last year. Our transport program moved 222 animals to our partners in 2011 and 950 last year alone. So far this year, we have altered, vaccinated and released over 540 community cats, and provided a low-cost spay and neuter for over 175 pets of Montgomery County residents. In our capacity as a partner to both local shelters, we have assisted with over 64 medical cases from the Conroe Animal Adoption Center and 243 medical cases from the Montgomery County Animal Shelter. Many of these cases involved surgeries in the range of $1500 each to mend substantial injuries that otherwise might have been cause for euthanasia. The Petco Foundation investment will help our County continue to move forward to increase our live release rates at both shelters. A compassionate, forward thinking community does not limit their focus to education and health of their human citizens. We also care about our four-legged family members. Beat the Heat! Spay/Neuter Your Pets! Did you know OPA offers a low cost Spay/Neuter Program for ALL Montgomery County Residents that have unaltered cats or dogs? Spaying and Neutering your pets is the single most important way to save lives of homeless pet, by reducing unwanted cat and dog populations! Plan A. offers Spay/Neuter for both dogs and cats for as low as $30 if you are on any kind of government assistance, or make less than $40,000 a year (must show proof of income/assistance). Plan B. is $80 for Spay/Neuter of dogs and $65 for cats, and is for anyone who does not qualify for Plan A. (no proof of income/assistance necessary). Have We Finally Arrived at a No Kill Montgomery County? We have [almost] arrived! Since our inception, Operation Pets Alive has been working hard to help Montgomery County become a 'No-Kill' Community. In 'no-kill' parlance, this means our shelters are saving over 90% of the animals they intake each year. Though the road to no-kill has been filled with twists and turns, our volunteers and supporters have tenaciously stayed the course to help our community achieve this major milestone. It is rewarding to know that, seven years later, we are just about there! The Montgomery County Animal Shelter just posted a 92.5% live release rate for 2017, and the Conroe Animal Adoption Center was close behind posting a 88.7% live release rate for the year. Is our work here done? I don’t think so. * New management at both shelters has squarely set their sights on increasing the live release rates. * OPA continues to assist both shelters with medical expenses, but we have now moved beyond simple x-rays to more serious procedures. * We launched OPA in 2011 with a major focus on transporting pets from our over-full shelters to other parts of the county. Now, many more rescue groups have established transport programs adding to our overall life-saving efforts. * Hurricane Harvey challenged OPA, and the rescue community, to work together to move animals out of shelters to safety, quickly, and in great numbers. OPA answered the call, engineering no less than four flight and ground transports within the span of a few weeks to clear the shelters for Harvey victims. * During 2017 OPA increased adoption venues, which remain open to animals from both shelters, as well as our own OPA pets, as a second means to move animals out of crowded shelters and into homes. As a result, we saw a 30% increase in local adoptions during 2017. * OPA has joined forces with Texas Litter Control and the Bruce Knapp Fund to TNR even more of Montgomery County’s Community Cats thereby reducing births and shelter intake. OPA also saved over 100 additional feral cats, at risk in the shelter, pending the approval of a feral cat program for the city of Conroe. In 2018, we’re charting new territory through a grant to introduce Dogs Playing for Life™ programs at both local shelters. This structured playgroup program will enable our community to save more lives by giving shelter dogs much-needed exercise and socialization during their shelter stay. OPA has seen our all-volunteer organization grow in both the magnitude of volunteers and achievements. And further, thanks to the generous support from our community, we have continued to fund that growth through donations. I am honored to be associated with such a dedicated and capable group of animal lovers and to be a part of an organization that has helped our community achieve a laudable 'No-Kill' milestone. Kudos to all! Looking forward to more progress in 2018! President, Co-founder Operation Pets Alive! Because of your support, Operation Pets Alive rescued a total of 3,125 homeless pets in 2017 from within Montgomery County. Take a look at our breakdowns. A total of 1,842 dogs and 1,283 cats were saved from our County Shelters, and within our community. During 2017 OPA transferred 921 dogs and 245 cats, via ground and air, to partnering shelters and rescues in other areas of the country where a greater demand exists for adoptable pets, and a 99.9% save rate amongst those transferred ~ mainly through our ‘Pups On Trucks’, ‘Flights For Life’, and ‘Cat Taxi’ Programs. OPA had a great year for local adoptions with 806 dogs and 623 cats finding forever homes within our Community ~ a 30% increase from last year! In addition, OPA helped hundreds of other pets in our community through other Programs. Our low cost Spay/Neuter Program assisted families by altering 99 pets. We also helped over 150 pets in need from MCAS and CAAC with outside veterinarian services. Our TNR Program alone, ensured that 302 community cats were spay/neutered and vaccinated, so they could live safely in our community without reproducing. An awesome job by volunteers, fosters, partners and our supporters! Chewy To the Rescue of our Homeless Pets! We love Chewy ~ and we know if you give them a try ~ you will too! Great service, FAST and free shipping (for orders over $49), and when you place your first order through Chewy using the button below, Chewy will donate $20 buckaroos to help our homeless pets! Plus, Chewy offers a 20% discount off your first autoship order. Make your life easier. Find EVERYTHING your pet needs ~ quality foods, treats, supplements, toys, bedding and more at Chewy! As always, we thank you for your support! Animal Hearted Offers Discounts on FUN Apparel that Benefits OPA! How awesome is it that Animal Hearted, has partnered with us at OPA to offer discounts on their wonderful line of pet-related T-shirts and other very cool apparel? Very awesome! Just go to https://www.animalhearted.com. Shop from their outrageously fun dog and cat lovers clothing line (and other items), use the code SUPPORTOPA at checkout, and not only will you get a 10% discount on your total purchase, but 25% of all final sales (excluding shipping, etc) using this code, will support us at OPA and help us save countless more lives! Thank you Animal Hearted! Animal Hearted Apparel is a clothing company with a conscience. Like us at OPA, they are passionate about animals. Not only do they make fun and creative clothing and accessories for animal lovers, they are dedicated to saving the lives of shelter animals. Their generosity and vision has helped save thousands of shelter pets, and with your help, together we can help save many more! That's right! In January 2016, OPA celebrated its 3,000th homeless pet transported via our combined 'Pups on Trucks','Flight for Life', and 'Kittens with Wings' transports! Thank you to Tom Martin for designing our celebratory image! 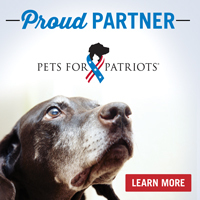 Operation Pets Alive is a proud adoption partner of Pets for Patriots, a nationally operating 501(c)(3) charity saving lives through companion pet adoption for United States veterans. Click the badge to learn more! Check out the news coverage in San Diego on the latest flight for life! Shop our OPA Etsy Store for beautiful hand-crafted items. For you, your home, and your pet! All meticulously designed by our OPA volunteers!